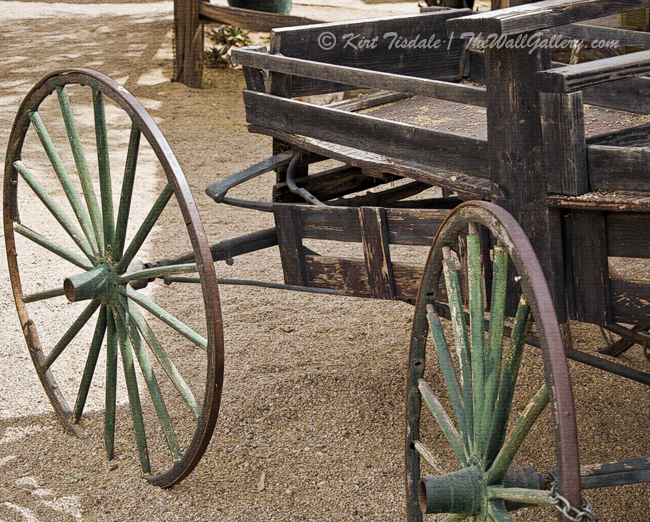 The art print I wanted to feature today is from my Sepia Photography Collection titled “Wagon Wheels”. This art print is a sepia photograph of two wagon wheels on an old west wagon. The wagon dates back to the 1800’s in the heyday of the “Wild West”. I liked the wagon in this shot, and wanted to focus on the wooden wheels rimmed with steel. Notice the wood grain even in the spokes and throughout the back of the wagon. The original leaf spring can still be seen supporting the back structure of the wagon on the axle (not that they ever really made a ride smooth between the ruts in the dirt and the unforgiving wheels). The position of the wagon on a dirt street completed the look I was after for an old west art print. Because of the subject matter of this photograph, my inclination was to convert it into a sepia tone print. Sepia photography is the brown color tones we associate with very old photographs. The look is a result of the technique used in developing photographic film during the 1800’s and early 1900’s. Today we can create that same look digitally. My first step was to convert this photograph into sepia, which I did. I also liked the color of the wheel in the original shot, so I played with allowing some of the green to bleed through. I liked the effect with just a light touch of color. To finish off that old west look and feel, I added some subtle texture for added warmth. Thoughts? I invite you to come into the gallery to view the new additions to the collection in Sepia Photography. This entry was posted in Photography, Sepia Photography and tagged interior design, old west, online art gallery, photographer, sepia prints, sepia tone, wagons, western, wild west on July 14, 2014 by Kirt D Tisdale. What are the elements in a black and white photograph that make it an art print? There are numerous aspects to a shot that elevate it from just a photograph to an art print. I’ve decided to focus on three elements in part 1 and then three more in part 2. Using an art print “The Back of a Carriage” from my Black and White Photography 2 Collection as an example, lets take a look at each of those elements. Simply put, the composition of a picture is the subject matter and the way you have displayed it in the picture. The subject matter could be numerous objects or a single object. How have you “composed” the picture to create a visual story. Looking at the example, this a singular subject and they way I composed the shot focuses in on the back part of an old carriage. In this case the composition is very specific and intentional to an area of the carriage. The depth of a shot is important because it allows your eye to see additional dimensions and keeps the subject matter from being flat. 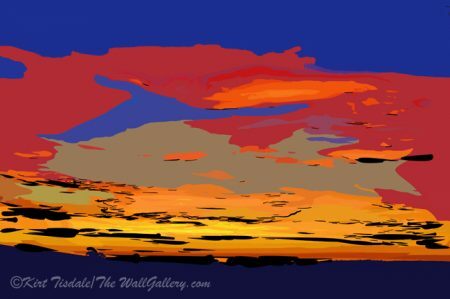 Depth should allow the eye to see past the focal point, but pull back to it naturally. 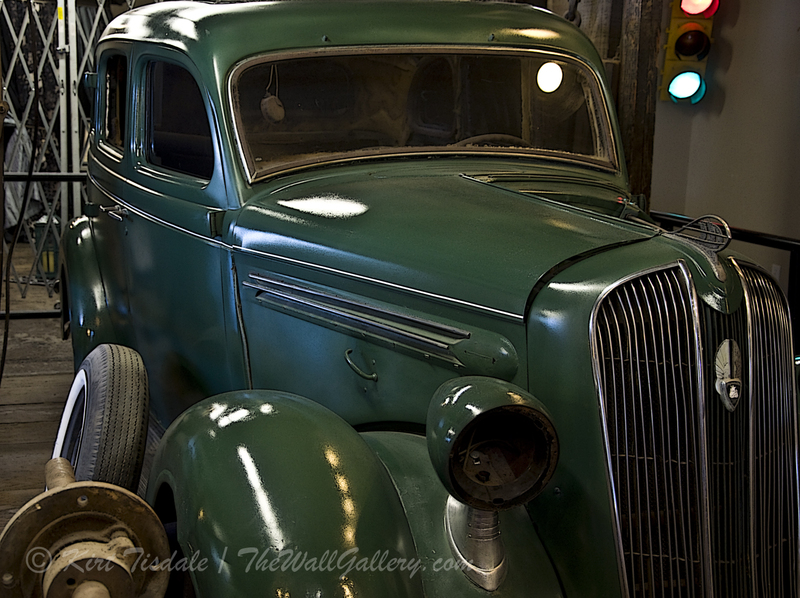 With the featured art print, you get a sense of depth as your eye looks past the back wheels to the front wheels which are slightly out of focus and then beyond to the street and the walkway across the street which are blurred. Your eye naturally comes back to the portion of the shot that is in focus. I look for strong lines and intriguing details that I know will be highlighted by the black and white tones. The strong lines are the most obvious in this example as the back of the seat, leaf spring, axle and wheels are very defined shapes. An example of intriguing details would be a landscape where leaves on a tree are lost in a color version, but pop out in black and white. Losing the strong colors allows the shades of gray to bring out detail. In the featured art print, “The Back of a Carriage” has a unique composition that immediately creates a story and pulls the eye in with interest. 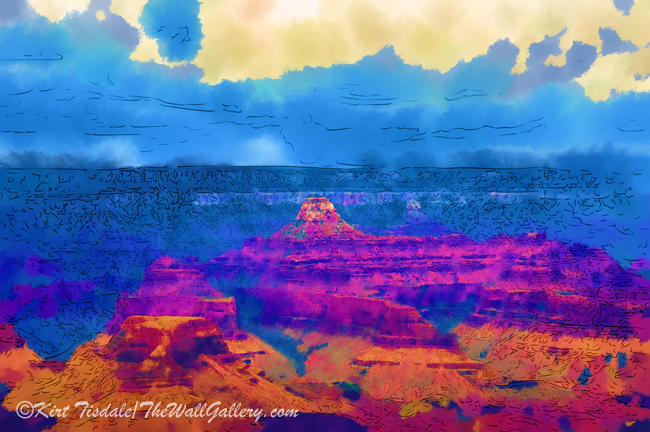 The depth keeps the interest as the eye scans the print and comes back to the focal point. The lines of the subject stand out as darker grays and pulls the visual immediately to the subject matter. The details within those lines add a level of interest as you explore them. Instead of being a flat, monotone, uninteresting photograph, you have an art print ready for framing and display. I invite you to come into the gallery to view the new additions to the collection in the Black and White Gallery 2. 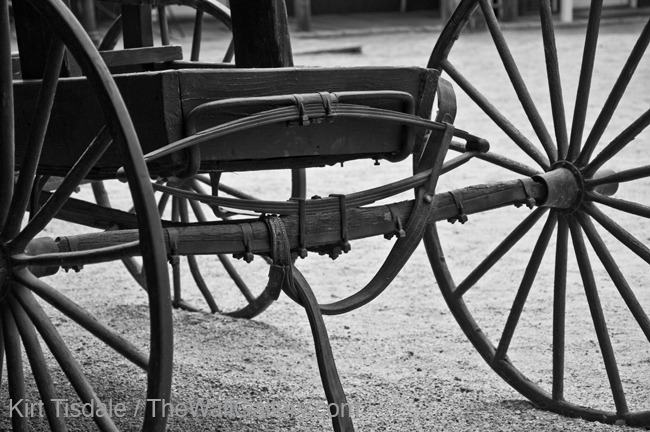 This entry was posted in Black and White Photography and tagged art prints, carriage, historic, interior design, kirt tisdale, old west, online art gallery, photographer, photography on June 30, 2014 by Kirt D Tisdale.